Designing a small boat that can be rowed easily, is stable in a variety of sea conditions, and is a pleasure to look at has challenged generations of builders and trained marine architects. The most successful results have evolved as one designer has influenced the next until something perfect, or close to perfect, emerges. John Hartsock grew up rowing a variety of small boats, and his experiences with the best of them led him to regard their designers as being “wonderfully intelligent people with an intuitive feel for hull shape and a willingness to communicate with one another.” As an engineer and computer programmer, he was convinced that a superior rowing boat could also be designed from a set of mathematical equations. His conviction eventually led to the 14′ Cosine Wherry. 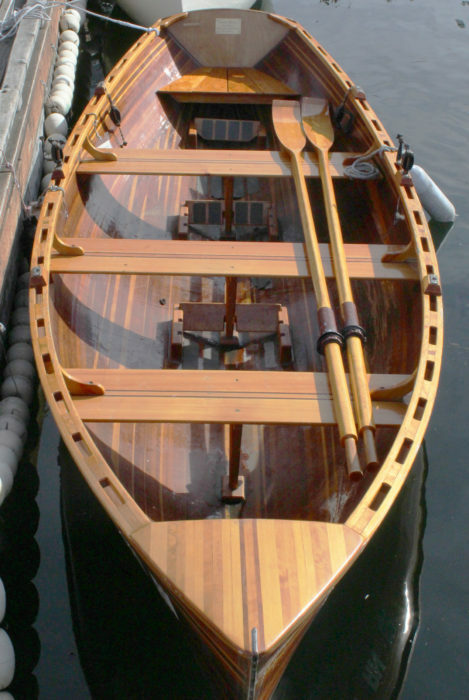 Its similarity to a Whitehall rowing boat is both a nod to the designers and builders of the 19th century, and confirmation that his mathematical approach to design worked. John’s detailed explanation of his approach can be found in WoodenBoat, May/June 1991, or at Concrete Canoe. 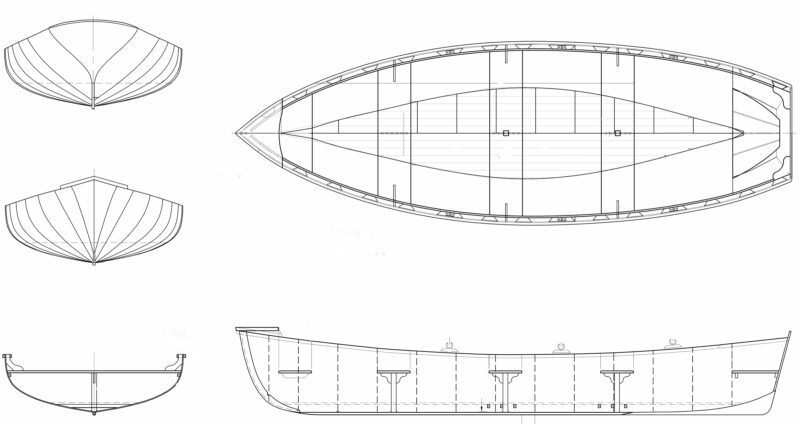 The author’s Cosine provides a clear view of the hull’s interior. The strips in the bottom of the hull run parallel to the keel; those forming the topside are parallel to the sheer. The transition is at the turn of the bilge. The Cosine Wherry is 14′ 2″ long with a beam of 52″ and should weigh about 100 lbs when built to the plans. It is strip-planked with 1/4″ x 3/4″ red cedar, and sheathed inside and out with fiberglass cloth and epoxy. Building time is at least 200 to 250 hours, though that will vary considerably depending on the builder’s experience, whether or not the strips are purchased or milled from solid planks, and how much detail is put into finishing touches. For my Cosine, I cut my own strips, sawed my own hardwood veneer for the transom, and laminated an outer stem that is not in the plans. The guide I used for the construction of my boat was Rip, Strip, and Row: A Builder’s Guide to the Cosine Wherry, written in 1985 by J.D. Brown in partnership with John Hartsock, Bob Pickett, and Erica Pickett. The Picketts were highly regarded proprietors of a marine-lumber company in Anacortes, Washington; they sold materials and kits and were a source of help for many builders. Rip, Strip, and Row takes the beginner builder from selection of materials, with a detailed cut list, through construction of the mold, planking and fiberglassing the hull, to finishing the interior. The inexperienced builder will appreciate the attention to detail in constructing the building form. This is the stage where precision is a must: get the form exactly right and laying the strips is a pleasure, like piecing a jigsaw puzzle together, rather than a battle to force pieces into place. 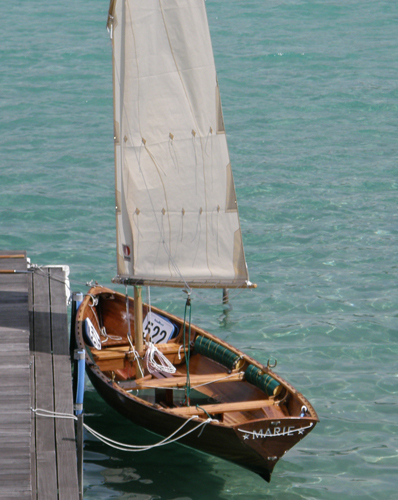 In this Cosine Wherry, built by Richard Davison of San Diego in 1992, the thwart knees, included in the original design, strengthen the gunwales, reducing flex when the boat is rowed hard. Rip, Strip, and Row was written almost 35 years ago and is no longer in print. There are a number of online sources for the book, but be sure to ask if both large pages of the patterns are still in the envelope attached to the inside of the back cover. An alternate source for both the plans and a builder’s guide is Ray Klebba’s White Salmon BoatWorks (link below). Builders will want to use additional sources to take advantage of newer techniques and approaches to construction. I appreciated Susan Van Leuven’s Woodstrip Rowing Craft: How to Build, Step by Step (published in 2006, it’s also out of print but available from many on-line booksellers). She details the project from molds to launch as she builds two cedar-strip rowboats. Her Rangeley Lakes boat is similar to the Cosine Wherry, and following her steps saved me a lot of head scratching, especially during the final stages of piecing together the interior. Rip, Strip, and Row is not big on interior details and leaves much for the builder to decide: whether to add a seat in the bow, how best to build the rubrails, how to fit the stern seat, etc. Woodstrip Rowing Craft provides excellent guidance for these kinds of details. At each of its three rowing stations, the Davison-built Cosine has adjustable foot braces described in Rip, Strip, and Row. While the book states they “aren’t necessary, but they are handy,” foot braces are an important addition for rowing with power and control. 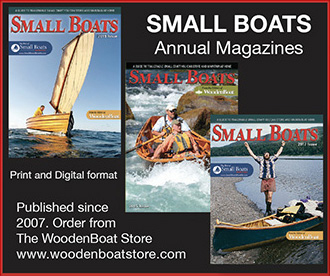 When you build a cedar-stripped boat, you’ll need to decide whether you’ll use bead-and-cove strips or square-edged strips, and whether or not you’ll use staples to hold the strips to the molds or go without staples to avoid the rows of small holes that turn into dark specks in a bright-finished boat. Having built a cedar-strip kayak some time ago, I felt confident building the wherry with square-edged strips and without staples. I collected old inner tubes from a friend’s bicycle shop—they’re great for squeezing the strips tight to each other while the glue dries. Square edges required a lot of crawling under the partly stripped hull to inspect the gaps between strips on the inside. The outside joints are visible and not difficult to make tight, but it’s easy to go too far with the plane and take away too much wood on the inside. It’s worth the time spent checking and fixing these gaps on the hull’s interior, because in a varnished boat that’s what you’ll be looking at once you get rowing. Working with square-edged strips saves time routing the beads and coves and avoids the unpleasant discoveries of gaps that show up between them when you begin fairing the hull. The editor, here rowing the Cosine solo, could easily lope along at 3-1/3 knots, sustain 4-1/2 knots at an exercise pace, and hit 5 knots rowing all-out. Hartsock designed the Cosine Wherry to be light. At approximately 100 lbs, he could carry it down the beach on his shoulders or hoist it onto a cartop carrier. I had originally planned to flip mine upside down on top of planks laid across my utility trailer. My wife, however, has had enough of wrestling boats around, and insisted that we buy a small boat trailer. That set me free to make changes which would add a few pounds but result in a more solid boat. I changed the transom from 1/2″ to 3/4″ plywood, and the 1/2″ plywood stem to a solid hardwood stem. I increased the width of the fiberglass cloth so that it extends farther toward the rubrails than the plans called for. 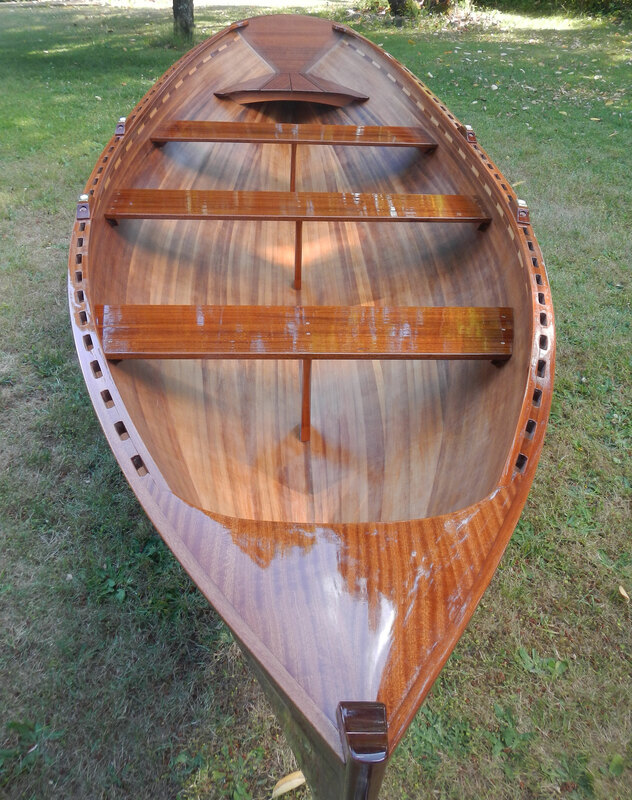 I used sapele hardwood for the skeg, the small keel strip, the seats, and the rubrails. The sapele rails required steaming, but once fastened they stiffened up the hull very nicely, and will take a beating that softwood rails would not withstand. Once the breasthook and thwarts were fitted snugly, the hull seemed stiff enough that I chose to not add thwart knees shown in the plans. I may add them later, even if only because they look good, and leaving them out seems a little lazy. The Cosine trims well with a rower at the forward station and a passenger in the stern. Rails, thwarts, and all the other solid wood pieces were given one or two coats of epoxy before receiving four to six coats of varnish. The sanding alone makes me wonder how anybody could build this boat in 200 hours. The only oars I had were an old pair I’d bought years ago at a hardware store. A neighbor convinced me that the wherry deserved good oars and urged me to make a pair to Pete Culler’s drawings in Boats, Oars, and Rowing. I found a nice piece of yellow cedar for the project; spruce or pine would have worked as well. The oars were a pleasure to make, and would prove essential in getting the best performance from the wherry. 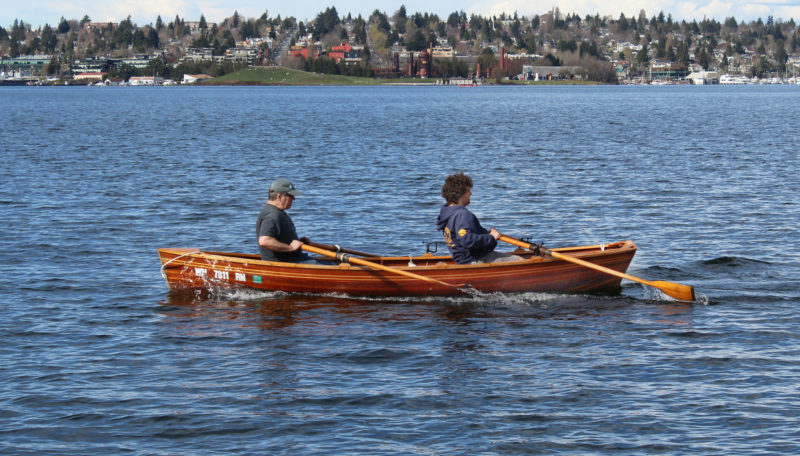 The editor, rowing with his son in the stern, brought the Cosine up 2-1/2 knots without much effort, held 3-1/2 knots with an aerobic effort, and peaked at 4-1/3 knots in a short sprint. On launch day, the Cosine was all I could have wished for. It does not in any way seem heavy with the hardwood bits and pieces I’d chosen to add. It slips through the water with hardly a ripple, tracks beautifully, and maneuvers like a charm. A rower sits on the middle thwart while rowing alone, and on the forward rowing station when a passenger’s in the stern sheets. The drawings include a third station aft so that two could row together, but it’s generally only my wife that I boat with, and we chose to avoid the “marital turbulence” that might result from rowing in tandem. Perhaps I’ll add the third station when I add the thwart knees. With two people rowing the Cosine wherry, there is plenty of room between the stations so it’s easy to avoid a clash of blades. The editor and his son held 4-1/2 knots with a moderate effort. The Cosine Wherry is wonderful to row. There is no mention of a sail or a motor in the book, and the builders who have outfitted a Cosine for sail agree that she rows well but are less enthusiastic about how she sails. And clamping an outboard on the transom would be, in my opinion, just rude. Perhaps the most convincing testament to how the wherry handles a variety of sea conditions is the repeated success that a Cosine named MAGGIE has had in the annual Great River Race, a 21.6-mile rowing race on the Thames River in England. MAGGIE has placed near the top of the 300 entrants for several years, and won first in her class and first overall in 2010 and 2013. While I won’t be entering any races with my Wherry, it is nice to feel the water slip away so easily beneath me when I lean hard on the oars. 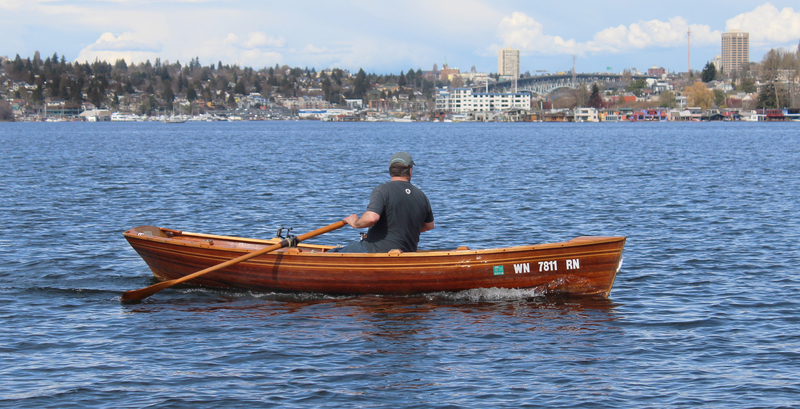 Paul McCuish’s first boat was a 10′ lapstrake rowboat that he received for his tenth birthday. It was much older than he was, and he spent more time stuffing the holes in it with rags torn from old blue jeans than rowing it. Since then he has always had a boat or two, most of them old enough that he learned a bit about building from having to keep them afloat. He’s a retired teacher, but he has worked as a carpenter and as a cook on a boat out of Haida Gwaii, British Columbia, Canada. The Cosine Wherry is his second cedar-strip vessel. The first was a One Ocean kayak designed by Vaclav Stejskal. He can use them both year-round where he lives on Vancouver Island. 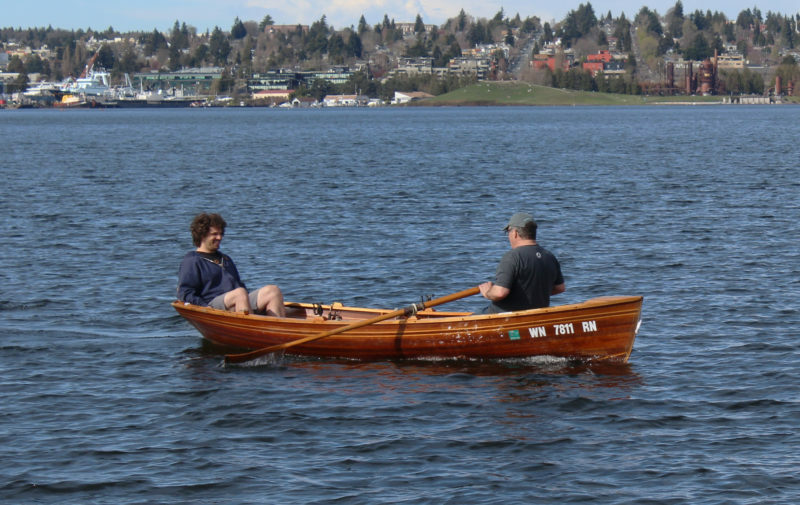 Plans for the Cosine Wherry are available from White Salmon BoatWorks for $135. They include full-sized drawings and an instruction book. White Salmon Boatworks, located in White Salmon, Washington, also offers kits and finished boats. Oyster Bay Boats builds Cosine wherries in Madeira Park, British Columbia. I built two of them ! John Hartsock sent me the plans to elongate the wherry to 16′. We equipped the first one with a daggerboard and a 76 sq.ft. spritsail. We had much fun rowing and sailing the wherry at Klopeinersee (Lake Kolpein), Austria, and between some islands in Dalmatia/Adriatic Sea. The boat was built lightly (110 lbs), could be transported on top of our car but the long straight keel without any rocker made tacking difficult. In stronger winds we often got stuck “in the irons”and needed some strokes with a paddle to come about. The spritsail was equipped with a handy brailing line but reefing in strong winds, out there was arduous. Because it was a good boat, I built a second one and some slight modifications were made : I increased the rocker a little bit and cut down the keel in the forefoot. This improved tacking very much. Then I slightly increased the sheer line by 3/4” and I switched from spritsail over to a balance lug-sail of the same size. So reefing the sail is easily done and the former uncontrolled rolling when sailing downwind with the spritsail is not noticeable anymore. The new wherry is a bit heavier (160 lbs) and feels more stable when stepping in. But the Cosine Wherry is designed as a rowboat, so because of the limited width and the low sheer line, which is good for rowing, we are often sailing “on the rails.” We sailed and rowed our new wherry at some raids in Venice Lagoon, had much fun and we were quite successful.